You'll find works from featured artists like Ed Hatch, who paints landscapes with a classic compositional structure and a certain amount of romanticism of Virginia's beautiful countryside. Michael Timothy Davis employs the fundamentals of the old 17th century Dutch Masters, evoking a timelessness of a bygone era. Michael Godfrey, on the other hand, is inspired by the many variations of light. His oil paintings seek to capture those "light moods" on canvas. Susan Blackwood paints simple, touching, beautiful moments that convey a message. 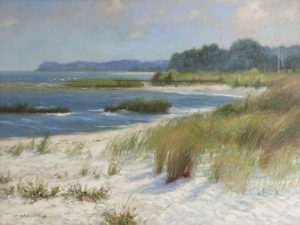 It's a rich, colorful language that has won her Best of Show at the American Women Artists National Exhibition in 2010. These are just some of the talented artists that showcase their extraordinary work. There are plenty more to enjoy! 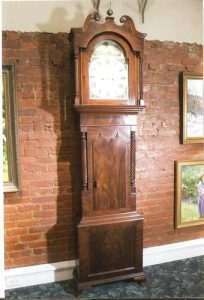 The Gallery also has a beautiful display of antiques like the English Tall Case Clock, which predates 1860. Or, the 19th-century Reproduction Hunt Board. Plus, several of the artists there specialize in portraits. From executive, casual, to formal, you can have a timeless piece commissioned. And they do portraits of pets, too! With so much to see at the Berkley Gallery, it will be easy to lose track of time. But that's okay. You'll find several great restaurants to choose from. The Black Bear Bistro & Brick Oven serves classic American cuisine, and local wine and beer, which you can enjoy on the patio if it's warm, or by the fireplace. Denim and Pearl's is a classic Italian restaurant that serves everything from sandwiches to full course meals. There's lots to do in Warrenton. Come and see for yourself! Make your reservation at the Black Horse Inn here.